Cape4 Yachting has announced the sale of a 49.6 metre new construction project at the Admiral shipyard, part of the Italian Sea Group, for one of its clients. The newly sold and signed yacht, Called the Admiral C-Force 50, will be be built in steel and aluminium with an exterior design by Jure Bukavec of Unielle Yacht Design with an interior by Admiral Centro Stile accommodating up to 14 guests in six staterooms. Twin Caterpillar engines driving fixed pitch propellers will give her an anticipated cruising speed of 16.3 knots and maximum speed of 17.3 knots. Delivery of the C-Force 50 is scheduled for April 2016. 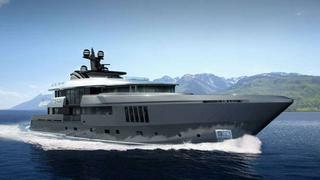 Admiral Tecnomar also has a 51.5m aluminium hybrid propulsion high-tech yacht under construction also due to deliver in 2016.